LORO PIANA Sage Ostrich Leather Bellevue Media Xupes Reference: HB2250 Serial Number: 92372 Age (Circa): 2010 Accompanied By: Loro Piana Dust Bag, Charm, Leather Swatch Authenticity Details: Serial Number (Made in Italy) Gender: Ladies Type: Tote, Shoulder Colour: Sage Hardware: Gold Material(s): Ostrich Leather Interior: Green Leather Closure: Tab Height: 24cm Width: 38cm Depth: 16cm Handle Drop: 19cm Excellent Pre-Owned Condition -The exterior is in excellent condition with minimal signs of use. -The interior is in excellent condition with minimal signs of use. -The hardware is in excellent condition with minimal signs of use. -The corners are in excellent condition with no signs of use. -Overall this item is in excellent pre-owned condition. Please note the majority of the items we sell are pre-loved unless stated otherwise. Please look over our pictures and descriptions as they display the most detail of the product. Please make a note of the measurements. Please note that this item may be subject to CITES regulations when exported outside of the EU. 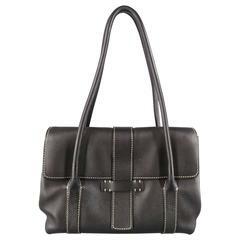 At Xupes we know that purchasing a pre-owned handbag online can be daunting. We aim to make your experience as seamless as possible, alleviating any concerns you may have when purchasing an item online with us. You can be assured that every item is carefully selected for our collection and is checked by our experienced in-house specialists to ensure authenticity. All of our items are precisely described and complete with studio images, meaning you can shop with complete confidence. Purple, brown and off white python. Dual top handles. Magnetic top closure. Sand color suede interior. Three interior opened pockets. One interior zippered pocket. Powder gray leather. Gold-tone hardware. Top zippered closure. Dual top handles. Removable shoulder strap. One large interior zippered pocket. Two interior opened pockets.